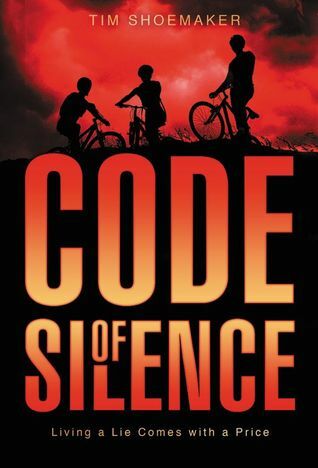 Code of Silence- A Teen Reader Review! Summary: Gordy, Cooper, and Hiro, are a trio that are never apart. They were together the night of the attempted murder and robbery of Frank’n Steins Diner. In fact, they were together inside the diner. That robbery left the owner (Frank) in a coma. Cooper noticed that the guys were wearing cop pants, and one was wearing leather boots. Hiding behind that counter was one of the scariest moments of their lives. Somehow escaping and taking the surveillance hard drive, they ran for their lives. One of the men caught up to Cooper. The man took Cooper’s house keys, threatened him that if he told anyone anything he would find his house and kill his family. When people approached, the man convinced them that he was a police and sent Cooper home. Now the trio had problems. They couldn’t go to the police because the guys were wearing cop pants, they had Cooper’s house keys. Telling the truth could kill them. But remaining silent could kill an innocent man. Is there ever a time to lie? And what happens when the truth is dangerous? The trio now has to make a choice. But both choices have their price. So right there, in Coopers backyard, they made a code of silence. They wouldn’t tell anyone about anything that happened that night. But living a lie, comes with a price. Where can I find a copy? : Paper copy available at Fairfield Public Library and Fairfield Woods Branch Library. Digital copy downloadable from Hoopla through Fairfield Public Library. This entry was posted in Books You May Have Missed, Friends, Mysteries and Thrillers. Bookmark the permalink.